We often hear that running a large company is one of the most complex jobs in the world. Business schools, strategic consultancies, headhunting firms, training providers, executive coaches all have a tendency to mystify the work of the CEO. However, effective CEOs see their jobs in much simpler terms and consider this simplification an important element of their effectiveness. That was one of the surprising findings of a research project we undertook over the last five years. In order to understand how the CEOs themselves see their work and which factors make them successful, we interviewed a carefully assembled selection of truly international CEOs from the world’s twenty biggest economies (other findings are reported in our book CEO School: Insights From 20 Global Business Leaders). Although our respondents come from different continents, countries, industries and types of companies, they all emphasised four essential roles of a CEO: envisioning; nominating; enabling and managing crisis. They also shared specific practices – iterative behaviour strategies – that help them play these roles. Across a series of four articles, we will expand on each of these roles and how these CEOs carry them out. We start in this article with envisioning. We would like to illustrate how dynamic envisioning works with the story of a CEO – let’s call him Alex – with whom we have worked closely for many years. Alex was a management consultant when the founders of a privately owned conglomerate offered him a senior executive role. After a series of acquisitions, they decided to create a stand-alone energy company and Alex was the natural choice for CEO. The young CEO’s brief was simple: Turn this collection of assets into a business, without any extra capital. But Alex was more ambitious than that. His vision was to create the country’s best-run company in terms of performance, systems, management, talent and reputation… within five years. He wanted the business to be an employer of choice, a supplier of choice and (given his brief from the owners) a borrower of choice. He shared all this with the organisation. On a more personal level, his ambition was to prove himself as a CEO and make his family proud of him. The company’s HQ was in the region he came from, not the nation’s capital. He wanted to build his hometown’s economy and prove that it could be home to a great company and attract executives of top international calibre. In his first year, attracting top executives is exactly what he set about doing. At the same time, he put in place a transparent system of reporting and improved the performance of the company’s various components by reducing waste and cutting costs. In his second year, Alex concentrated on building the newly recruited talent into a team, consulting them on all key decisions. He also reached out to people in all parts of the organisation, invested in new technology and introduced modern policies, procedures and governance practices. Along the journey, he also saw some of his own limitations, notably in image and public speaking. So he got himself a coach, some new suits and attended courses at INSEAD and Harvard. By the third year, all the basics were in place. Alex was able to refine his vision and focus on more sophisticated practices, such as company-wide talent development as well as health, safety and environmental (HSE) management. By the fourth year, the company had adopted some world-class practices. There was a corporate university, a bottom-up innovation programme and a new compensation system for managers, based on both performance and development. Alex was not only investing in the training of his people but of his suppliers and customers. Based on his recommendations, the board also reorganised the corporate governance system. By the beginning of the fifth year, Alex had received several awards for being the country’s best CEO and the company had been ranked the nation’s top employer for two years in a row. The management team had also won an award for being number one in the country. The shareholders were making 30 percent annual return on their investment. The vision had become a reality a year ahead of schedule. Our respondents shared specific practices that help business leaders to develop and keep updating organisational vision. We would like to describe just four of them. One of our clients calls the first practice a “walking vision”, which comes from the idea of “walking the talk”. We just call it personification of vision. In other words, the CEO becomes a living representation of what her vision is about. If it’s about excellence, the CEO strives to excel in everything she does. If it’s about collaboration, she makes collaboration her way of work. Diego Bolzonello sums it up: “You must be an example to others and understand the meaning of your actions [for them]”. The second practice is sometimes called a “talking parrot”. But it simply boils down to reiteration of vision. Good CEOs use every opportunity to articulate their vision: regular management team meetings, corporate conferences, shop-floor walkabouts and occasional encounters in the office corridors. They may use different words each time, but they keep sending the same message about where the company is going and what it stands for. The third practice is operationalisation of vision. According to Richard Rushton of Distell Group (South Africa), the CEO is “fundamentally required to shape the future” and part of this future is internal. Corporate rules, policies and procedures, working methods and products… they all speak without having a mouth – and effective CEOs make good use of them to promote the vision. If your vision is “to be number one in the world in the shoe business”, as Diego Bolzonello claims for Geox, you have to make sure that you reward excellence rather than mediocrity. And you must recruit and promote ambitious people, giving them freedom to create and innovate. The same logic applies to investment projects, acquisitions or divestitures, as well as new products or services. 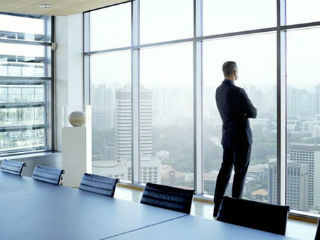 Setting, communicating and updating a vision for the business is the first and foremost role of the CEO. This vision provides the rest of the organisation with direction, meaning and culture – and becomes a decision-making benchmark for all managers. It may evolve but needs to be deeply embedded in the entire organisation at all times. *Senior Affiliate Professor of Entrepreneurship and Family Enterprise at INSEAD. He is also the Co-Programme Director of Leading from the Chair, one of INSEAD’s Board Development Programmes and a contributing faculty member at the INSEAD Corporate Governance Centre. **Deputy Director General in charge of Administrative Affairs at Gazprom Neft and is on the board of directors of NIS Gazprom Neft, Serbia. ***Writer specialising in business, careers and higher education. She holds a BA and doctorate from the University of Oxford.